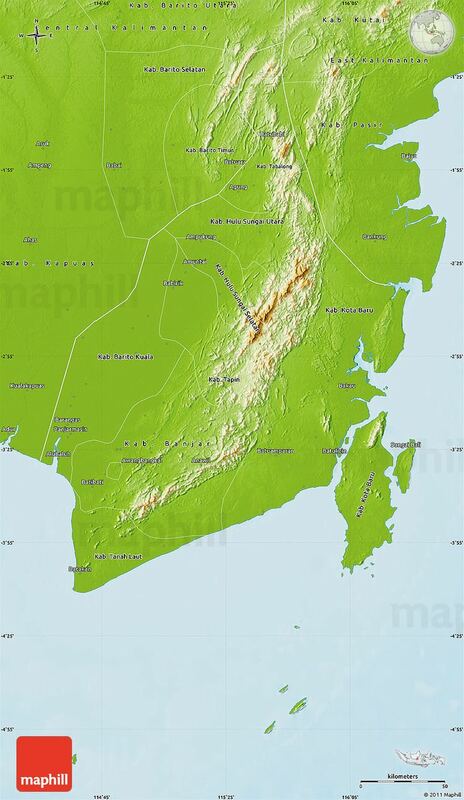 In terms of topography, South Kalimantan province consists of 4 parts, alluvial land, swamps land, hills and mountains. Land inclination with 4 class classification showed that 43.31% of South Kalimantan province has 0-2% land inclination. 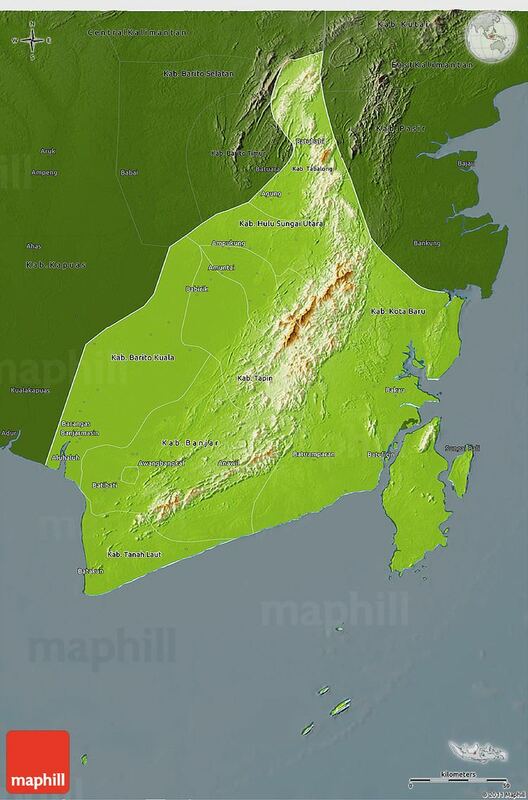 The area of South Kalimantan province according to altitude classes are divided into 6 altitude classes indicate the area of South Kalimantan Province mostly located at altitude class > 25–100 m above sea level, i.e. 31.09%. South Kalimantan province area flowed by many rivers. The rivers include Barito, Riam Kanan, Riam Kiwa, Balangan, Batang Alai, Amandit, Tapin, Kintap, Batulicin, Sampanahan, etc. Generally, these rivers originate from Meratus mountain and empties to Java Sea and Makassar Strait. The main natural resources in South Kalimantan are forest and coal. Coal deposits are found over almost the whole province, and in some places they are exploited commercially. Other minor resources are oil, gold, gem stones, quartz sand, phosphate and granite. In 2010, South Kalimantan's exports grew by 27%, the highest increase among all Indonesian provinces. The province's total exports rank seventh out of all provinces. In 2008 the number of visitors to the province was 339,000 of which 21,000 were international visitors, mostly from China, Philippines and India. The history of government in South Kalimantan is expected to start when stand Kingdom of Tanjung Puri about 5-6 century AD. This kingdom is located quite strategically in the Foot Meratus and on the banks of large rivers that later became the city are quite advanced. Kingdom of Tanjung Puri could also be called Kahuripan, who is known as the first container of hybridisation, i.e. tribal engaging with all its components. Afterwards, migrants from Java started establishing the Kingdom of Negara Dipa. In the 14th century appeared the Kingdom of Negara Daha which has elements of Javanese culture due to silting of the river in the territory of Dipa. An attack of Java destroy this Dipa kingdom. To save the kingdom, the new dynastic leader Sari Kaburangan Maharaja immediately ascended the throne and moved the government in the downstream direction, i.e. toward the ocean in Muhara Rampiau. the Dipa Kingdom was spared from total destruction, it can even organize themselves into a state with a name of Daha with the king as the main leader. State Daha eventually declined with the advent of the power struggle that took place since the Prince of the ocean to take up arms on the estuary, as well as build a house for the grand vizier who was in the estuary. The main leader of the patih named MASIH. While the residence of the MASIHcalled Bandarmasih. Raden Samudra build a palace on the river bank to the patih MASIH Kuwin them. The city later called Banjarmasin, which is derived from the word Bandarmasih. Banjarmasin kingdom evolved into a major maritime empire until the late 18th century history changed when the Dutch destroyed the kingdom of Banjar in 1612 by the king when it Panembahan Marhum Banjarmasin, the center moved to Kayu Tangi kingdom, which is now the town of Martapura. Early 19th century, the British began to look Kalimantan after expelling the Dutch in 1809. Two years later placing the resident to Banjarmasin namely Alexander Hare. But his power is not long, because the Dutch again. The new round of South Kalimantan's history began with the rise of the people against the Netherlands. Pangeran Antasari as leaders of the people of the brave. He died on October 11, 1862, and his descendants as an advanced form PEGUSTIAN Kingdom of Banjarmasin, which finally abolished the Dutch army Malay Marsose, while Sultan Muhammad Seman who became its leader died in battle. Since then, South Kalimantan was fully occupied by the Dutch. This area is divided into a number of department, namely Banjarmasin, Amuntai and Martapura. Furthermore, based on the organic division of Indisch Staatsblad 1913, South Kalimantan is divided into two section, namely Banjarmasin and Hulu Sungai. 1938 was also formed with capital government Borneo Banjarmasin and First Governor dr. Haga. Right after Indonesia's proclamation of independence (17 August 1945), the government under Soekarno and Hatta appointed Ir. H. Pangeran Muhammad Noor as the governor of the whole of Kalimantan on 18 August 1945; its capital was Banjarmasin. Later on, it was decided to divide the area into several provinces. 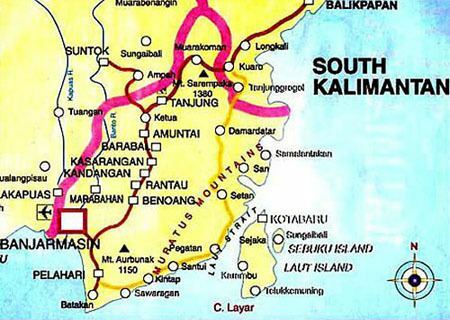 On 7 December 1956, the province of South Kalimantan was formed out of these areas: Kotawaringin, Dayak Besar (Great Dayak), Daerah Banjar (Banjar Region), and the Federation of Southeast Kalimantan. Later on, Pasir regency (a part of the Southeast Kalimantan Federation) was transferred to the province of East Kalimantan instead. Furthermore, on 23 May 1957, Kotawaringin and Dayak Besar removed themselves from South Kalimantan to form their own province, Central Kalimantan. The majority of the population in South Kalimantan are ethnic Banjar which consists of three groups, namely Banjar Kuala, Banjar Pahuluan and Banjar Batang Banyu. There are also ethnic Javanese, Madurese and Sundanese who came as migrants. In coastal areas Tanah Bumbu and Kotabaru also dwells ethnic Bugis (Bugis Pagatan) and Mandar originating from Sulawesi. Dayak in South Kalimantan region occupies around the Meratus mountains (Dayak Bukit) and at the bank of the Barito River (Dayak Bakumpai). Other ethnic groups in South Kalimantan, namely the ethnic Arab descent contained in Banjarmasin and Martapura. There are also ethnic Chinese origin who inhabit the area of Chinatown in the city of Banjarmasin and Sungai Parit in Pelaihari (Cina Parit). The language used in everyday life by Banjarese as a mother tongue and as a lingua franca for the people of South Kalimantan generally is the Banjar language which has two major dialects, namely Banjar Kuala dialects and Banjar Hulu dialect. Dayak tribes who inhabit the southern region of the Meratus mountains spoke the Dayak Meratus language. The Dayak Dusmala (Dusun-Maanyan-Lawangan) that use Eastern Barito language inhabit the northern region of the Meratus Mountains uses the Dayak Maanyan Warukin language, Dayak Samihin language, Dayak Dusun Deyah language, Dayak Lawangan language, and Dayak Abal language . While the Dayak Biaju that uses the Western Barito language inhabits the streams of the Barito River uses numerous language among others Dayak Bakumpai language and Dayak Barangas language . The Dayak Ngaju language, a language originating from Central Kalimantan is used as a liturgical language in the Borneo Evangelical Church headquartered in Banjarmasin. Islam is the majority religion adhered to around 96% of people in South Kalimantan. There was also Christian, Hindu and Buddhist communities as well as the Kaharingan belief embraced by the Dayak people who lived around the Meratus Mountains region. The tourism sector is a potential business opportunity in South Kalimantan as many of the attractions that are frequented by tourists, both from within the country like any of the foreign countries. South Kalimantan has almost all types of natural attractions such as the sea, beaches, lakes, and mountains. 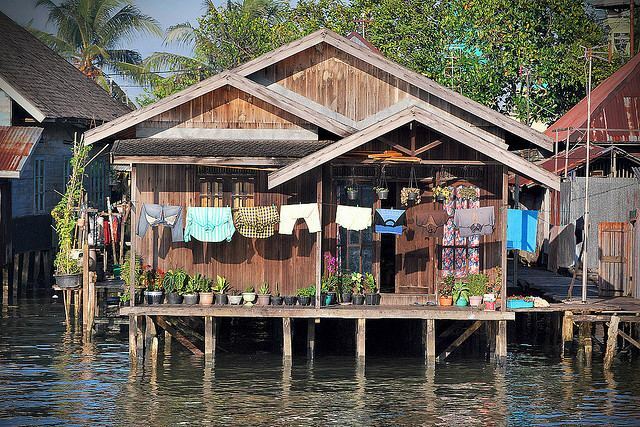 Besides South Kalimantan tourism is also heavily promoting the typical culture, such as the Floating Market Festival, Festival Tanglong, and others. Besides the natural and cultural attractions, South Kalimantan also famous for culinary tourism.